It’s 2019 and dads change diapers. But while it’s common to enter a women’s bathroom and find a changing table, they’re far and few between in spaces for dudes. Late last year a photo of a Florida dad struggling to change his son’s diaper while he squatted on the floor went viral, which led to the hashtag “#squatforchange” with dads sharing stories about the difficulties of changing diapers in public bathrooms. 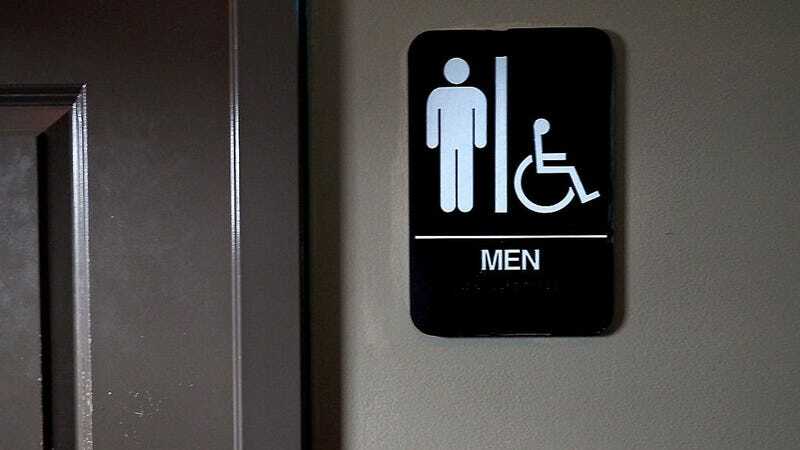 And it seems like New York has heard these complaints loud and clear because a new 2019 law requires all new and renovated buildings with public bathrooms to have changing tables in both the women’s and men’s bathroom, ABC News reports. The law was originally announced back in April by New York Governor Andrew M. Cuomo. It’s wild that this change is just happening now, but it’s an inevitable reflection of the role dads play in 2019. According to a 2018 Pew Research study of U.S. census data, 17 percent of stay-at-home parents in 2016 were dads, which is a 10 percent increase from the amount of stay-at-home dads in 1989. The bumbling, Three Men and a Baby stereotype just doesn’t fit anymore. Dads just want to change a diaper in peace! While I hope that one day gender-neutral bathrooms are the norm and everyone can feel comfortable just going to a genderless place to pee and/or change a baby’s diaper, for now I will settle for making both women’s and men’s bathrooms as equal as possible.